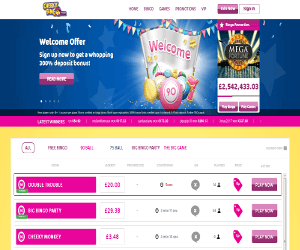 Welcome to Cheeky Bingo, the cheekiest bingo site online! On entering the site, you will be welcomed with all categories of games available. You will also see huge slides going back and forth with the latest promotions on the site. Continue reading for more information about the latest promotions. Sign up today and get your hands on a smashing 300% deposit! All you have to do is sign up and deposit £10+ and you’ll receive a bonus of up to £100. Come and celebrate St Andrews Day with us at 9pm on Thursday 30th November 2017. There will be prizes on all lines. Full House: £75, 2 Lines: £50, 1 Line: £25. All losing cards share £100. Race on our reels as from Monday 27th November 2017 to Monday 4th December 2017! This opens at midnight. Stand a chance to win £3,000. All you have to do is “Opt In” and play any slot game you desire. There’s always more fun when there’s a big jackpot sitting around. Join Cheeky Bingo at 9pm, 30 November 2017 where you will walk away with a guaranteed prize. Full House: £2,500, 2 Lines: £1,500, 1 Line: £1,000, 1TG: £800, 2TG: £700. Losing Cards Share: £1,000. Are you abit of a night owl? If so, this late bingo game is just for you. Every night, from 11pm the “90 ball jackpot” room has a jackpot worth £200! What even more exciting is that all cards are priced at 50p. What are you waiting for? Stand a chance to win big in one of these cheeky rooms!